The Fisher Lab Refrigerator / Freezer Combo provides useful and reliable combination storage for convenient access to samples used daily and helps maximize your space. This lab refrigerator is ideal for basic laboratory storage and is constructed out of durable materials such as enameled steel, and ABS plastic interior to withstand rugged daily use of a lab environment. This general-purpose lab freezer/refrigerator combo comes with independent manual adjust temperature controls for top and bottom and uses an automatic defrost. The Fisher Lab Refrigerator comes with adjustable shelves and two storage compartments, along with in door shelving for added space. This upright refrigerator freezer also features foamed in place insulation for great uniformity. The Fisher Combination Refrigerator Freezer has a 4°C refrigerator bottom with 13 cu ft of storage, while the freezer area at -20°C , has 5 cu ft of space. 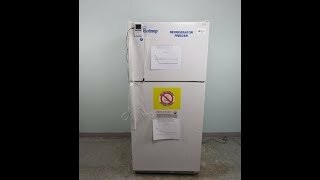 30" x 30" x 67"
The Fisher Scientific Freezer Refrigerator has been tested to ensure unit is performing well and comes with current validations. Please note there is a slight chip in the door handle, pictured, however it does not impact performance. All of our lab equipment comes backed with out standard warranty. Should you have any questions about this or any of our other lab refrigerators, please don't hesitate to contact us.